PhoToPlan is our well-known software for true-to-scale digital image rectification of plane objects. The software works inside the familiar AutoCAD and AutoCAD LT environments. The result is a versatile image plan, which allows for easy measurement of areas and disUtances. The image plan connects photographic documentation of existing conditions with exact geometrical information. Rectified images can be used to draw plans of façades or acquire geometrical data of ceilings and wall frescos. Using traditional CAD commands and/or PhoToPlan tools, accurate dimensions are pulled from the photo instantly and digitizing is a snap. PhoToPlan 3D adds functionality to the classical photogrammetric dual image evaluation in AutoCAD. 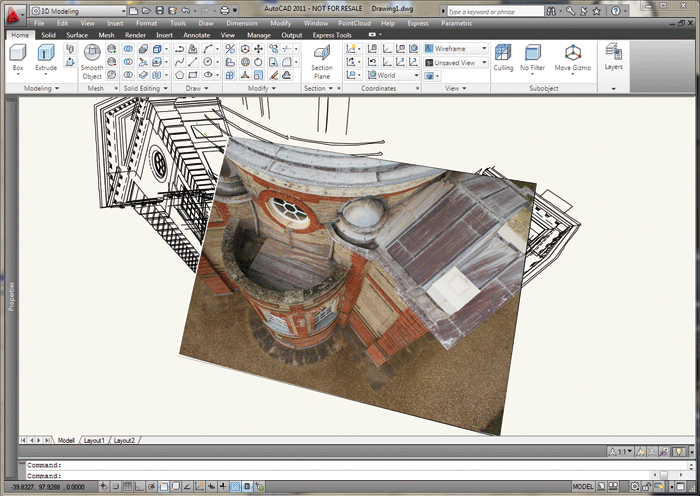 By clicking corresponding points on two oriented photos of the same object, PhoToPlan 3D calculates the 3D coordinates of this point and places it into the CAD drawing. This makes it very easy to draw 3D wireframe models in AutoCAD. With PhoToPlan Ultimate surfaces of cylindric objects can be projected into a plane. An other additional function is the computing of ortho photos.